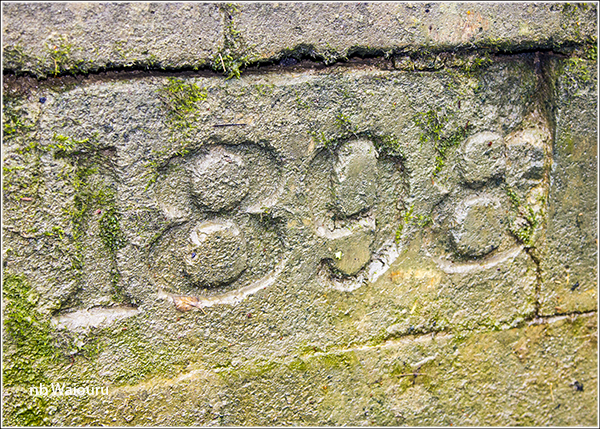 Although we have passed through Hillmorton Locks on a number of occasions this is the first time I have noticed the date carved into the coping stone on one of the bottom locks. Hillmorton Locks are paired and once above the bottom locks I noticed the pound was down nearly a foot. The same situation existed between the middle and top locks. The middle and top locks were only recently maintained and they now don’t leak. However the bottom paired locks are leaking quite badly which is probably the reason why the two pounds are low. Grantham Bridge boatyard between the bottom and middle locks looks to be rather full. There were boats moored in the pound between the bottom and middle locks. 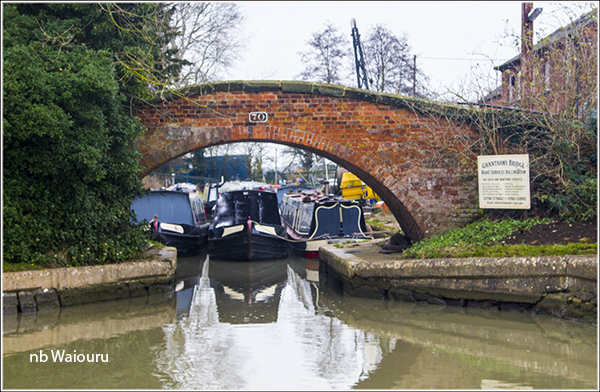 When Jan reached the middle locks she found a man emptying the left lock. But there was no boat coming down? Then she realised he had both top and bottom paddles open. He explained that he was living on a boat in the pound and was spending much of his time running water down because his boat kept developing a list. We cruised passed Hillmorton Wharf (diesel 74p/L) and then along Barby Straight. 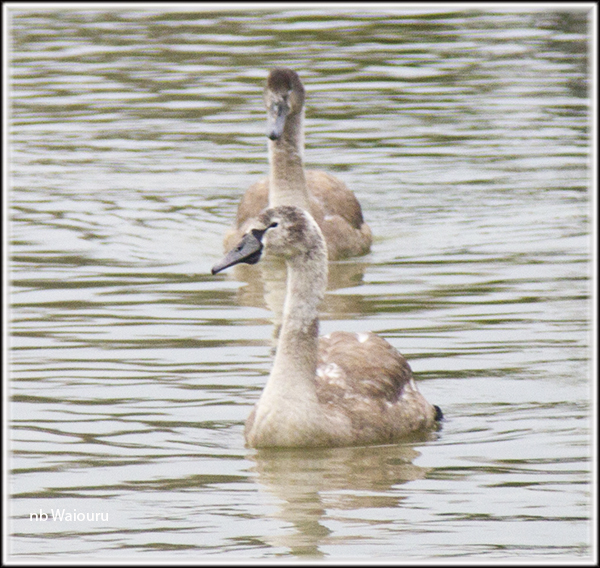 There were a couple of late young swans near the entrance to Barby Marina. Looks like they have just been kicked out of home. I wonder if they will survive the winter. We found a quiet piece of steel piling within sight of Braunston Church spire and called it a day. The major lesson from today was to add a couple of more layers of clothing if we are going to cruise in this weather. We’d not long been moored when there was a tap on the side of the boat. A lady out walking her dog. She asked “Are you from New Zealand?” Must have been the name on the boat! It transpired she was a fellow kiwi living on a 68ft narrow dutch barge with her husband who is originally from Yorkshire. 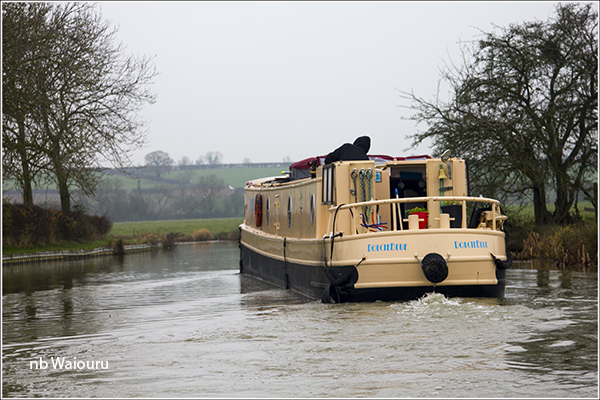 We had a long chat before she headed back to Braunston. Their boat subsequently passed alerting us to the fact with a toot from their horn. I called out that it was rather cold to be cruising and was informed “It will be warmer next week!” I wanted to know how he could be so sure and was informed “Because we will be in Spain!” That’s when I remembered his wife mentioning they were leaving the boat in Barby Marina for three months and heading to Spain for the winter. We were just getting resettled when nb Draco passed towing Butty Success. We missed you on Wednesday - we were moored at the far end of the park and passed you as we went to wind at the bridge, but no-one seemed to be around. 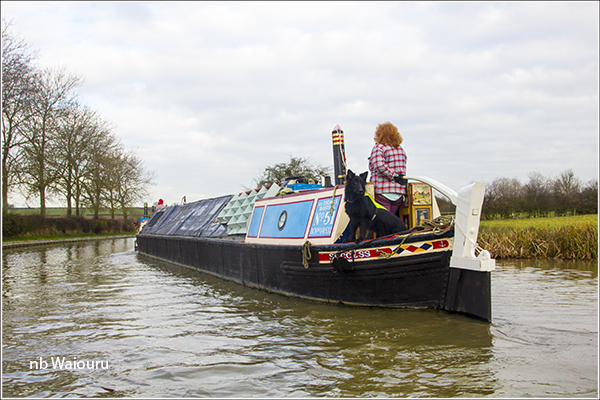 We chatted to the lady with dog from Dolcie Blue when we moored at Braunston that night - she really hates the winter mud and was keen to be out of it! That'a shame. Hopefully there will be another opportunity in the future. How could we forget you and Della! :-) Thanks for the blog link, we now have you listed on our blog and will follow you with interest.